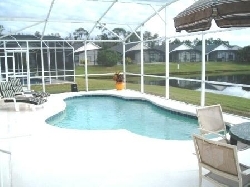 3 bedroom 2 bathroom villa which sleeps 6 with a private heated pool. Eagles Pointe is situated off Ponciana Blvd which is just off Hwy 192 where you can find all your restaurants, shops and bars. Disney & other theme parks are approx 10 mins drive from the villa. 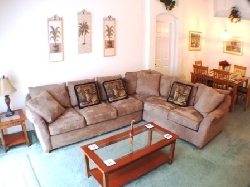 The villa is situated on the delightful Eagles Pointe resort. 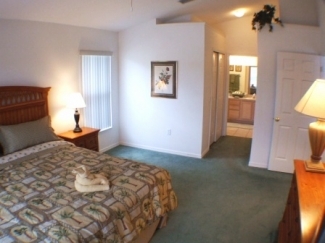 Well decorated and has recently been re-furnished throughout. Beautiful views from the family room which looks over the lake which is teaming with wildlife. 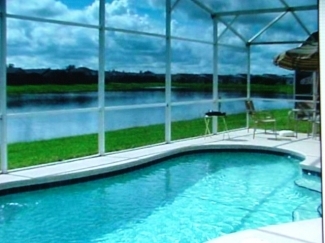 Admire the exotic birds which frequent the lake while you take a dip in the screened, heated pool. Fishing is permitted and welcome. 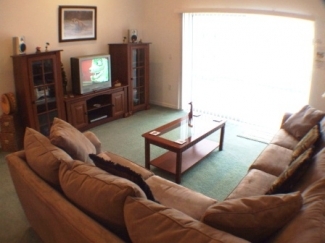 The living area is equipped with wall to wall carpets, upgraded furniture, large television, cable and dvd player. The Master Bedroom comes complete with a King size bed and full en-suite bathroom including walk-in shower, w/c and twin basins. 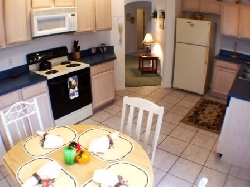 There is a large window overlooking pool & lake and the room has its own walk-in wardrobe and cable television. The second bedroom comes with a Queen size bed, ample storage facility including walk-in wardrobe and is fitted with cable television. The third bedroom comes with twin beds, ample storage and cable televsion. 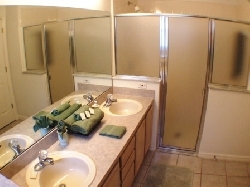 The second bathroom benefits from twin basins, w/c and bath with shower. The villa has a fully fitted kitchen equipped with fridge freezer, dishwasher, microwave, waste diposal, 4 hob cooker and oven/grill. Ceramic tiled flooring. All utensils, dishes/crockery, toaster are included. Washing machine, dryer and iron can all be found in the utiliy room. Private heated pool approximately 25-30ft in length, pool side furniture including sun loungers, seats and parasol. Daytona/Cocoa Beach approximately 1 hour drive to the east. ClearWater/St Petersburg beach approximately 1 hour drive to the west. Orlando International Airport is approximately 20 mins drive. Sanford Airport is approximately 50 mins drive. We recommend use of a car for travelling around. All theme parks are within easy access, approximately 10-12 mins drive away. 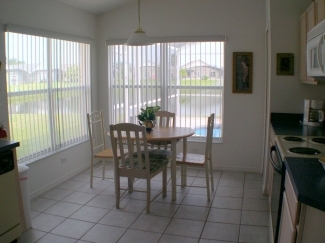 Downtown Kissimmee approximately 5 mins drive and Downtown Orlando 40 mins drive. Prices are per week for the rental period in GBP. We can provide quotes in USD if required.